You may see the usual Halloween suspects on Halloween night – zombies, witches, the cast of characters from Game of Thrones. I’m betting you won’t see anyone dressed up as Eric Hill. 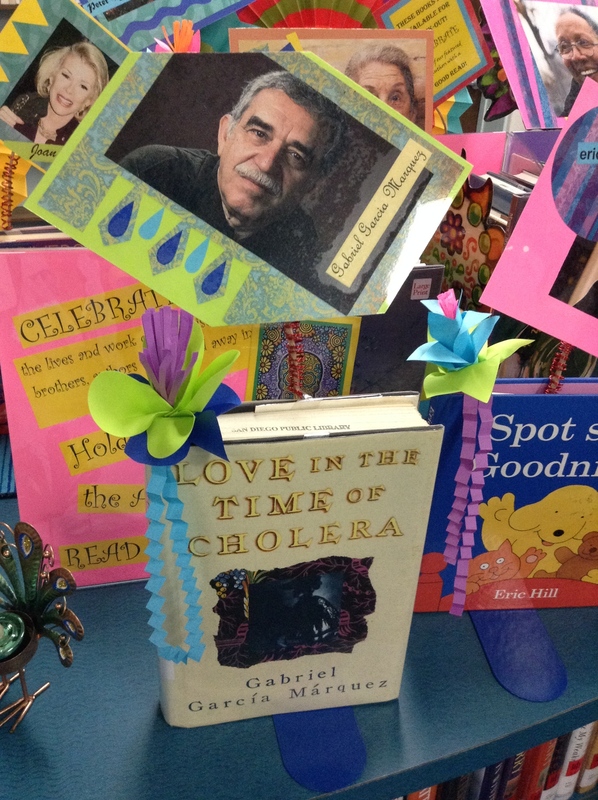 Or Gabriel Garcia Marquez. Never mind Peter Matthieson, Maya Angelou, Walter Dean Myers, Daniel Keyes or Joan Rivers. 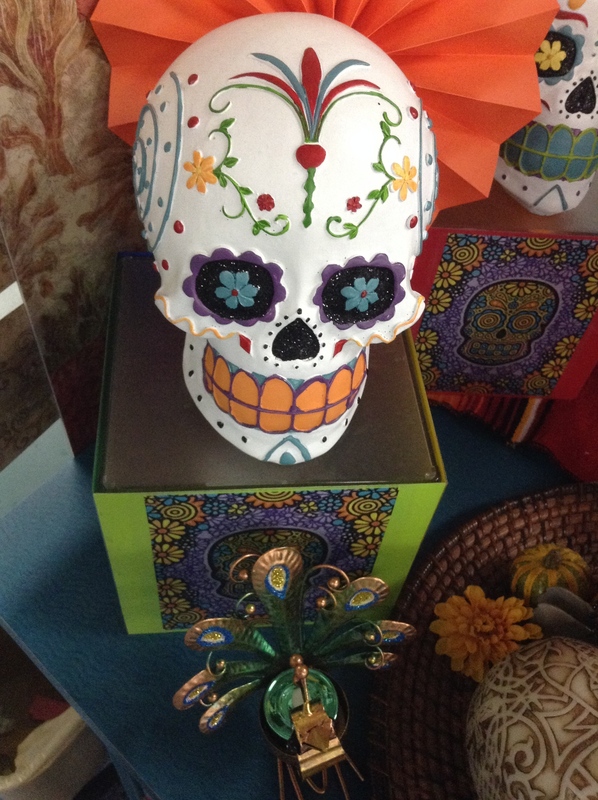 No matter, I saw them all today in the Ocean Beach branch of the San Diego Public Library artfully arranged among food, drink, paper flowers, candles, and skulls. 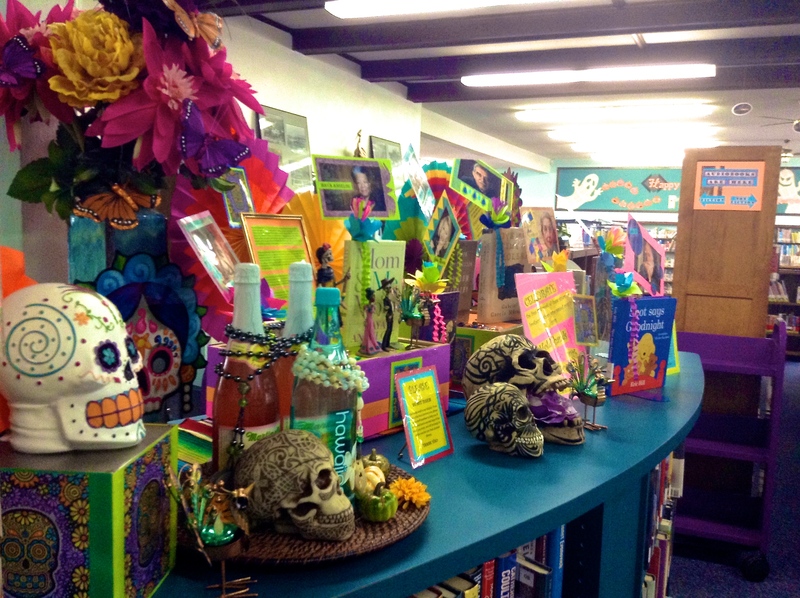 They were honored in an imaginative ofrenda put together by one of our librarians, Jan Kregers. 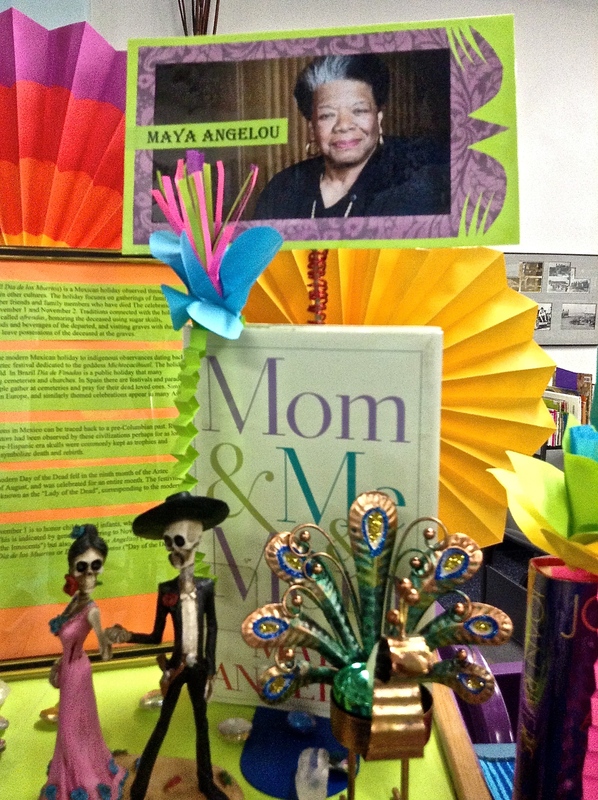 She’d put it together to honor authors who died this year, evoking the Mexican tradition of honoring the dead on Dia de Muertos or Day of the Dead. On that day, family members — ancestors — are honored, remembered, offered their favorite foods. Each offering has a meaning. For a brief time those who still live and those who are gone reach across the divide for a while in memory, stories, lessons learned, laughter shared. Seeing these writers together brought their passing home to me in a way that was both sad and joyful. 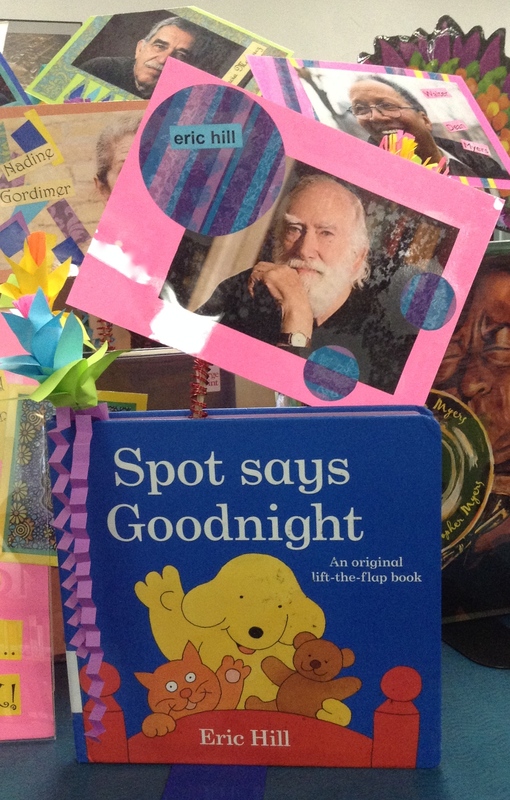 There was a sense of discovery when I learned that Eric Hill was behind all those “Spot” books. When I looked at the photograph of Daniel Keyes, I remembered the first time I read Flowers for Algernon” years ago and how the story and sadness stayed with me for days and how I went back and read it again. Gabriel Garcia Marquez is one of my favorite writers of all time as is Nadine Gordimer. There they both were, their faces framed in magenta, yellow, and lime green paper petals. It was kind of magical, really. And joyful because as sad as losing them was, they each left so much behind: memories, stories, lessons, laughter — and we can enjoy all them any day just by picking up one of their books. 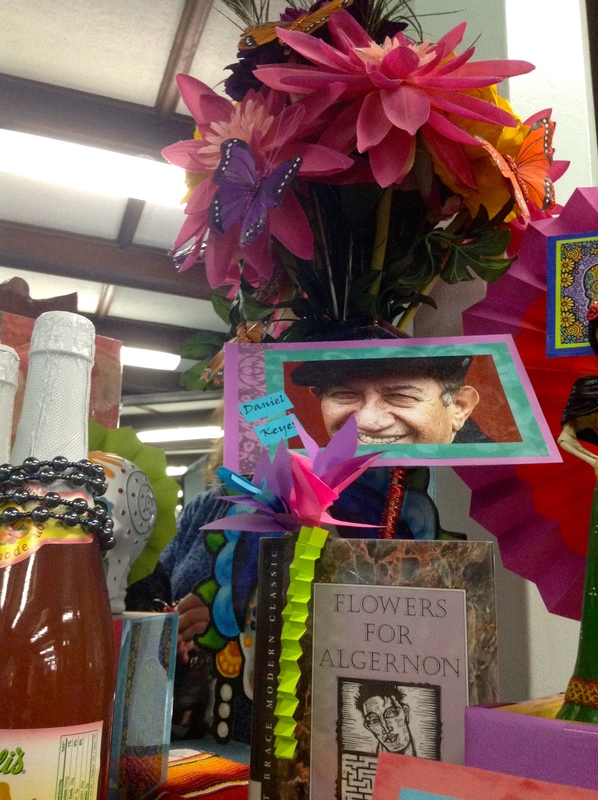 If you were to do your own writer’s ofrenda, which authors would be on it? How wonderful your library did this. Thanks for sharing and great pix and piece. My very first exhibit my senior year on art production was a Mexican Day of the Dead celebration and it was fascinating. But this take on authors from out recent past is amazing. Seeing these writers so lovingly remembered brought tears to my eyes. 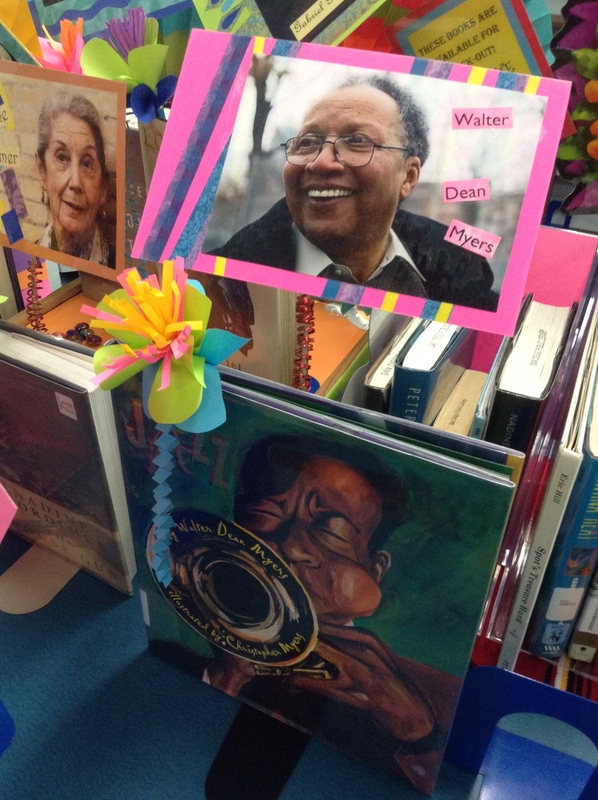 Thank you for sharing these inspiring, moving photos! with her community, and, with your appreciative recognition, many more. How very thoughtful of you both. Beautiful, Betsy. 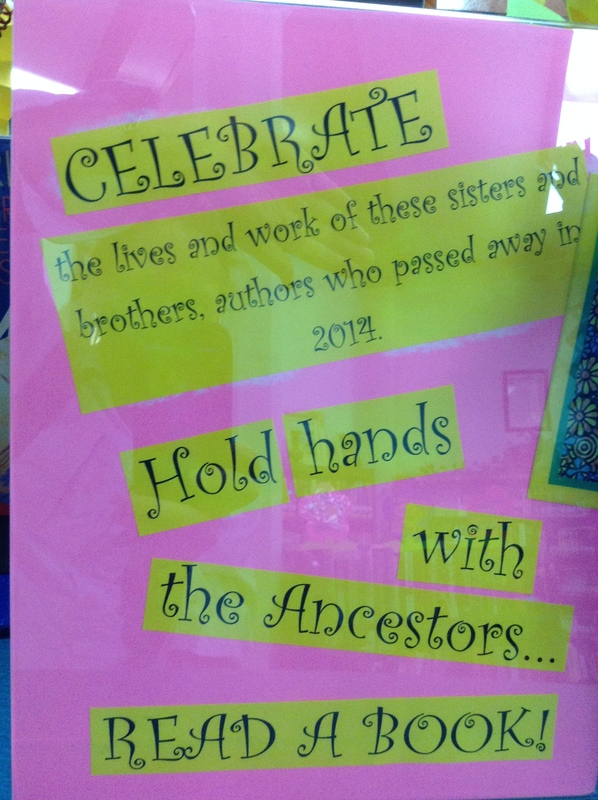 “Hold hands with the ancestors,” love that. I’d include Paul Monette on my altar. His passionate writing as a gay man with AIDS in the late 80’s & his book “Becoming a Man” changed my life & my identity as a member of the queer community. Amazing man & writer. Makes me want to go re-read his work. Very nice! What a creative way to build the connection between the holiday and reading! I did see Charles Dickens on the stage of the NY Public Library last night — Halloween night. He was brought to life by Neil Gaiman, who spoke about his new rendition of “Hansel and Gretel,” among other things. Betsy, thanks so much for sharing this wonderful display with us. You clearly have a fabulous library!